Ramse brings Olivia into the facility and Cole is stunned that he's managed to capture Olivia. Olivia has a long list of crimes to pay for because she served the Witness. Cole is anxious to get to Ramse but Jones stops him to point out that they need to know which Ramse they are dealing with; the grieving father or the loyal friend. Jones reminds Cole that Ramse spent decades taking orders from Olivia and wonders if Cole is even capable of discerning exactly who he is dealing with. Ramse puts a gun to Olivia's head and demands to be allowed further inside the facility. Jones makes it clear that she believes Ramse is a hell of a hunter but at this point, they aren't sure who caught who. Ramse and Olivia find themselves surrounded by armed men and are quickly disarmed. Jennifer warns Jones that Olivia is not a woman but a chameleon who displays what the viewer wants to see. Jennifer adds that if Olivia smiles at you, it's because she wants you dead. Jennifer advises that Olivia has never been anyplace that she didn't want to be and so Jones decides to have a cell built specifically for Olivia. Olivia is then place in a cell with an electrified chain link fence and is chained to the ground but she keeps a smile on her face the entire time. As the camera moves to follow Olivia's movement, she walks right up to the fence and waves at the camera. This unnerves Jennifer, who is watching on CCTV. Jones heads to see Ramse and his first question is, "where is Cole"? Jones quickly explains Cole's conflict of interest when it comes to Ramse and so Ramse begins to explain exactly how it is he ended up at the lab with Olivia. Ramse explains about the rift between Olivia and the Witness but Jones points out that Olivia has had thirty years to reach out to them. Jones is quite disbelieving of Ramse, until he informs her that Sam is dead. Ramse points out that Jones got Hannah back while he lost his son twice and though he knows he is going to die, he is determined to stay alive to get the Witness. Sam's death is about the only way he could have convinced Jones where he stands because Jones is intimately familiar with what it feels like to lose a child, even if she hasn't been sympathetic to Ramses plight before this moment. Cole heads to see Olivia, as Jones and Adler watch on CCTV. It turns into a song and dance with Olivia telling Cole that he's not actually an adversary but an annoyance at best. Olivia still has the smile pasted to her lips, clearly enjoying whatever game she's playing. Olivia knows that even though Cole is asking about Titan, what he really wants to know is where Cassie is. It seems she also has some resentment about being left behind. It turns out that Olivia was the little girl they ran into in Berlin in 1961. Jones, who has been listening the entire time, orders Adler to run a fulls series of tests on Olivia. Olivia charges Cole with feeding her to the Witness and his promise of a timeless forest. Olivia tells James to think about exactly why he's still alive considering that there have been so many opportunities to kill him. Adler interrupts to get his blood sample and to inform Cole that Jones wants to see him. In a flashback scene, we see Deacon sacrificing himself for Jennifer. In the present, Deacon is covered in blood Mallick is sewing his open wounds shut. Mallick tells Deacon that he is his secret to keep. Deacon is so out of it that he hallucinates his father. Deacon is still very injured and is covered in bloody bandages in his cell. Food is slipped under the door for Deacon while his father questions Deacon's decision to eat because nothing is free. The next thing slipped under the door is a syringe. Deacon's father advises him not to be weak and not to be the pawn of other men but Deacon injects himself anyway. While Deacon is out of it on the drugs, Mallick enters the room and start to clean up up again, explaining that one day in the future, Deacon will be called upon. Alone again, Deacon hallucinates his father and attempts to attack, only to be reminded that he's actually alone. Deacon picks up a rock and uses it to scratch a marking on the wall. Clearly, Deacon is not going to start to count the days of his captivity. The results are in on Olivia's test and Jones is quick to call them impossible because no one should be that strong. Jennifer is busy playing with the light coming from the Splinnter machine. We get a flash of an adult Olivia confronting herself as a child and then a flash to present day Olivia in her cell. It's Jones's turn to have a chat with Olivia. Olivia talks about her childhood and makes it clear that her father turned her into a golem and that Jones made her golem out of metal. Olivia says that she wants a place in the past free of Jones and safe from the Witness and if Jones does this, she'll hand over the Witness. Jones points out that if Olivia handed over the Witness, then she wouldn't need to run. Olivia questions if Jones would send James back even though James has a habit of creating the problems he's sent back to solve. Olivia says this while smiling into the camera, clearly aware that Cole is listening in. Olivia is very good at her game play and she taunts Katrina about Hannah and how Jones has lost everything but her machine. Olivia is marched into the splintter room and Jones orders Adler to prepare the machine. Katrina takes the safe guard off the splintter machine and uses it to torture Olivia. Deacon is still in very rough shape but he's quite far since Mallick first stitched him up. Deacon is however still hallucinating his dead father, who has no problem reminding Deacon that he's a bad man and has not found redemption. Food is slid under the door and Deacon's father once again reminds him that nothing is free. Rather than jump on the food when offered, Deacon uses a bar in his cell to begin some very painful pull ups. Everyone watching what is going on with Olivia is transfixed by it. It's Jennifer however who says that machine doesn't like what is happening and that it's hurting the machine. Jennifer clearly doesn't see the splinter machine as an inanimate object. Hannah now understands why Jones was called Dr. Grim. Finally, after what seems like an interminable amount of time, Jones stops the torture. Jones starts to question Olivia but only gets smugness in return and so Jones orders Olivia to be tortured again. It's Hannah who puts a halt to this by putting a knife to the throat of one the scientists. Hannah is shocked by her own behaviour and she pulls the knife from Lansky's throat, telling her mother that torture is not the way. Hannah leaves the room and Jones follows quickly behind her. Cole approaches Olivia, who is still strapped to the chair, bleeding from the mouth. Olivia questions if Cassandra would approve and Cole answers that Hannah is right and that this isn't the way. Cole decides that Olivia should go to the munitions bunker which is half flooded and filled with rats. Hannah and Jones are at odds about what Jones did to Olivia. Hannah rightfully believes that what Jones did was barbaric whereas; Jones says that it's all about the greater good. Hannah argues that what Jones did was revenge for losing her. Jennifer tries to interrupt the conversation but both women are too emotional to pay her attention. When Jones finally pays attention, she turns around to find both Olivia and Cole gone, only for Cole to appear moments later. Cole tells Jones to follow him. Cole admits that he and Ramse have tortured people for information before and suggests that Jones is doing it wrong. In Cole's opinion, people break when they are afraid. Cole realised that given how she was raised, Olivia is scared of being trapped in a box. Cole used the splintter machine to transport Olivia back in time for three months, and that she has been locked in the box the whole time. When they open the door to the munitions bunker, the floor is littered with dead mice and each mouse has a bite taken out of it. Olivia is curled up into a ball and is shaking in a corner. A crying Olivia says that she's ready to talk. Jennifer heads to see Ramse, who's less than pleased to see her. Jennifer offers Ramse condolences for Sam and adds that no one has said that to Ramse and meant it. Ramse wonders what it says about this place that in order to be human, you gotta be a little "crazy". Jones looks through a window at Olivia and she is approached by Hannah. Hannah talks about the stories she heard about Doctor Grim, who fed people to her machine. Doctor Grim became a story people told their children in order to scare them into being good. Hannah explains that though she has killed more men than rabbits or deer, the stories of Doctor Grim stayed with her. Hannah says that she learned to be merciful and never cruel, so that she didn't turn into Dr. Grim. Hannah says that knows that the stories are true but that she also knows that this is not who Jones is. Jones takes to heart what Hannah says and takes a bowl of water into Olivia's cell to clean the shaking Olivia's wounds. Olivia is well and truly broken I think. Cole and Ramse finally reunite and the two men hug it out. There are now a number of markings on Deacon's wall indicating that he has been there for quite some time. Deacon is now fully healed and he works out while singing, "don't you forget about me". Deacon's father continues to remind him about the fact that he is being saved for something. Now that he's feeling better, Deacon is not inclined to wait to see what Mallick has in store for him. Using the florescent light in his cell, Deacon starts a fire in the hopes of forcing Mallick's hand. Mallick gives Deacon a set of directions and makes him memorize them. Alone in his cell, Deacon continues to work out and argue with his father. Deacon tells his father that he hates everything about him and what he did to him. Deacon even hates that he looks like his father. Deacon's father rolls up his sleeve and reveals the cigarette burns he got from his father and says that scars were all that he had to pass on. Deacon looks down at his arm and at his own scars and together father and son sing, "don't you forget about me." Mallick opens the door and tells Deacon that it's time to go. Deacon is now out of his cell and is making his way through Titan. Deacon makes his way to Cassie's room and kills the guards at her door. Cole and Ramse stand on the roof and discuss what Olivia told them. Cole is adamant that Olivia cannot be trusted. Olivia revealed that the Witness will appear in 2007 and will be surrounded by an army of followers. This could well be a suicide mission and so Ramse wants Cole to know that he is his family. Ramse and Cole head inside and prepare to travel and Cole promises Ramse that he will have the kill shot because of everything that happened with Sam. Ramse and Olivia make eye contact and we get a flash to him holding a gun on her calling her a liar. As Cole approaches the machine, Jennifer tells him not to go because she has a bad feeling about this. Jennifer is adamant that all of this is wrong but Jones says that their window to travel is closing. In a flashback, Ramse tells Olivia for her plan to work, she's going to have take a beating but Olivia is confidant that she can handle it. Olivia questions if Ramse can kill Cassie and after a moment's hesitation, Ramse says yes. I really liked that the Enemy took the time to flesh out Deacon's character a little bit. Up until this moment, Deacon has been nothing but a gang leader who just so happened to fall in love with Cassie. His relationship with Cassie created a love triangle which this show doesn't really need. 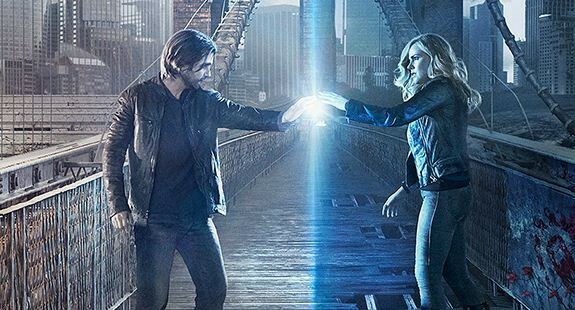 I suspect the fact that Deacon is alive and will be the one to save Cassie from Titan rather than Cole means that 12 Monkeys is going to continue on with this storyline. I'm not surprised to learn that Deacon has a troubled past but this is the first time that 12 Monkeys has really bothered to humanise his character and Todd Stashwick, really pulled it off. Up until this point, there's really only been a brief discussion about those that died for Jones to perfect her machine. Jones was absolutely driven to get the splinter machine working to stop the plague in its tracks and to save Hannah. This meant that she was willing to do anything and several people died. This is the first time that the horror of her actions was reflected back at her and it was through Hannah. The ends justifies the means is a dangerous strategy to take because it means that there are no limits and when that occurs, people absolutely die. Can or should Olivia be trusted? Probably not but torture isn't an acceptable path either. I do however think it's interesting that 12 Monkeys decided to go down this road and make Jones's character German.Historically, she wouldn't be the first German doctor who decided that torture was an acceptable act for the supposed greater good. It creates a lot of conflict and I think we will see some growth out of Jones with this. Cole isn't much better than Jones. Sure, he didn't use pain to torture Olivia but he willingly put her in a situation which is equally if not more painful for a greater length of time. The only difference between what Cole did and what Jones did is that his actions were largely behind closed doors. No one had to hear Olivia's screams or witness her pain. What he did was make it painless for himself and the rest of the staff. I find it interesting however that no one saw fit to judge him the way the judged Jones. For the residents of the science facility, clearly the act of witnessing is what makes it torture. So, Olivia and Ramse were in bed together from the very beginning. I really did think that she was broken because she finally stopped smiling, so I suppose 12 Monkeys got me there. That being said, the conflict between Ramse and Cole was always on the cards for the simple fact that Cassie is the mother of the witness. Ramse loves Cole so he isn't going to take him out but as the Witness's father wouldn't it be easier to simply end Cole in the past? Without either Casssie or Cole, the Witness could not be born? 12 Monkeys won't go this path though because it has a nasty habit of setting up women to be a liability. The other interesting thing to come out of this is Jennifer's feelings about the splintter machine. To Jennifer, not only is the machine alive, she's female. I'm very curious to see if 12 Monkeys is actually going to go somewhere with this. If the machine is indeed alive, what effect is it having on shaping the past, present and future? Then we have Mallick who is clearly playing his own game. Why is it exactly he's so interested in saving Cassie given that her value has decreased now that she is no longer pregnant? Mallick clearly saved Deacon, so that Deacon and Cassie could escape Titan together? Mallick is also working alone which makes me wonder if he really is on side with the whole, end time and red forest Utopian fantasy that the others believe in?